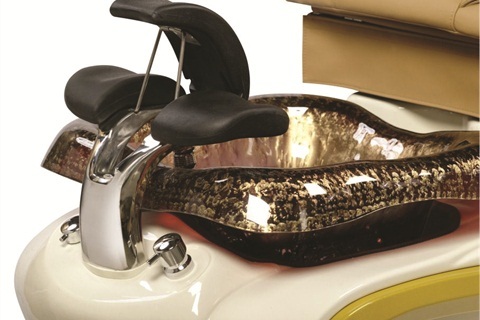 The new Gulfstream footrest is ergonomically designed with contoured footrest pads and an adjustable center pad to gently elevate the client’s feet, creating ease for both the technician and client. The new Gulfstream footrest is ergonomically designed with contoured footrest pads and an adjustable center pad to gently elevate the client’s feet, creating ease for both the technician and client. The La Fleur 4 (shown) has a hand-crafted, custom-made glass bowl and is available in eight rich colors. The acrylic base is available in three classic colors; there are three vibrant insert colors available to accent the base. The True Touch massage chair is equipped with shiatsu massage and comes in an array of colors. Gulfstream’s Lavender #3, La Violette, Mini Lavender, La Plumeria, La Fleur 3, and La Tulip 2 also feature the new footrests. For more information, go to http://www.gulfstreaminc.com/.